Last year, there was an opportunity in the state for certificated teachers who wanted to add a math endorsement to their certificate. There is no simple route to adding endorsements in this state outside of your major field. Basically, you have to do enough college-level coursework in order to be eligible for consideration---and depending upon the endorsement, you have to do a whole new round of student teaching, too. Seriously. The new program for math would pay all associated fees for teachers who wanted to take the math coursework---sponsors were even willing to send professors out to the masses, so if there were several people in a district participating in the program, Muhammed would indeed go to the mountain. Someone suggested that I participate. "No way," I said. I like math, but I don't want to teach math. Just because I'm aware that I could be math teacher doesn't make me want to run out and be one. I have wondered if similar sorts of things might be influencing the perceived gender inequities in other areas. I read a recent statistic that only 17% of college graduates with computer science degrees are female. Some are outraged by such a statistic. Me? I think it's possible that we're mixing equity of access with lack of interest. If there's no policy preventing females from majoring in computer science, all the outreach in the world isn't going to lead to equal representation at graduation. Seventeen percent doesn't necessarily mean women are adverse to computer engineering, it may well mean that they're interested in something else even more. Can we reliably tell the difference? We're nearing the end of the school year. And, like a seemingly interminable road trip, everybody is starting to get cranky by this point. Are we there yet? And even I, without a job that follows the school calendar, am down to my last nerve, too. The things that are sticking in my craw as of late all have to do with the fact that it is "testing season." Pick your favourite acronym out of the alphabet soup: AP, MSP, MAP, DRA, DIBELS---they're all ready and available for consumption like some All-You-Can-Eat Assessment Hell Buffet...and the soft serve ice cream machine is out of order. No wonder educators and students are ready to riot, just as the days turn long and summer holiday is so close you can almost touch it. As for me, I'm ready to kick some tail over two comments I am seeing repeatedly. I am seeing this usually in reference to state tests/standardized tests. Here's why I want to strangle the people who keep repeating this myth. In the case of standardized tests, teachers don't know what questions are on it. The tests represent only a sample of standards and there are different forms of test questions. There is no way for a teacher to teach to "The Test." Teachers can teach to the standards. We can tell them what sorts of formats the questions come in (multiple choice, short answer...). That's as far as we can go. However, if we're talking about classroom level assessments, then I truly hope that a teacher is teaching to the test. Teachers should not be using "gotcha" ways to assess kids. Tell them what they should be expected to know and do...how you will ask them to demonstrate this...and then keep your word. If you want to drill and kill, that's your business, but I would hope a wide range of instruction would be made available for students. Teaching to the test is the fair way for students to know what you expect. Comment #2: WASL Is Dead! This particular rant only applies to those of us in Washington, but you may see variations in your own state depending upon how elections go. Here, we have a new state supe. He changed the name on the test booklet, and voila! the old test is gone! Um, no. The test was already shortened last year when it had its old name. The test banks are the same ones used to build the old tests. Just because kids have to answer all the questions in one day instead of two doesn't make the test shorter: Kids need just as long to write. It costs the state just as much to build and score the "new" tests as it did for the old ones. It is the same test, people.There's just a different cover on it. What's so hard to understand? This sort of ignorance is even promoted in our newspapers: Goodbye---and good riddance---to WASL. This is creating further issues in terms of what the public is willing to believe. I had an EdTech type express concern earlier this week because schools would have to buy computers to be available for testing 5 days a year (and available for instruction the other 175). IT staff might have to set up computers and test connections. Yup. And for the past 15 years, schools have had to set up testing environments, pay for subs and extra para-educators, buy math "tools" (rulers, calculators, protractors...), have extra dictionaries, etc. It just never impacted EdTech---so they didn't have to care. Now that the tools (both writing and mathematical) are being replaced, suddenly IT is interested in the test. Costs aren't new---they're just shifting. So...same test. Same costs. Tell me again why you're so happy the test is "dead"? My mantra as of late has been "Summer is coming...Summer is coming." Sure, I don't get the sort of break that I used to, but I can't help but think the opportunity to get out and garden and enjoy some time in the sun will make me a whole lot less cranky. Maybe it will help others, too. At long last, I've been spending some time updating my gradebook template. I believe I last shared an Excel version 2.5 years ago---and the thing has been begging for a makeover ever after. Since then, I have posted several times about my interest in using conditional formatting (to create a "stoplight effect" for determining interventions) and sparklines to summarize data (see Data Viz: Part I for a refresher). I've now been making the time to put all these pieces in place. This sort of template is the number one request I get from teachers. It's time I had more than just good intentions. I have a file ready for your beta testing. There are a couple of screen shots below, along with some explanation. The one thing I am still working on is a student progress report worksheet which automatically updates. (I am only a Yellow Belt and some of this work requires Ninja standing.) In the meantime, I am hoping that some of you might be willing to download the spreadsheet and play with it a bit. You will need Excel 2007...and will need to enable macros when you open the file. Before I get into the nitty-gritty, I have to give major kudos and props to Fabrice over at the Sparklines blog for the original template file. He has done an amazing job producing this open-source (not to mention free!) add-in for Excel. This shows the basic setup for tracking student data and the advantages of using Excel over most electronic gradebooks. The commands you would need in order to make changes are provided in red font. 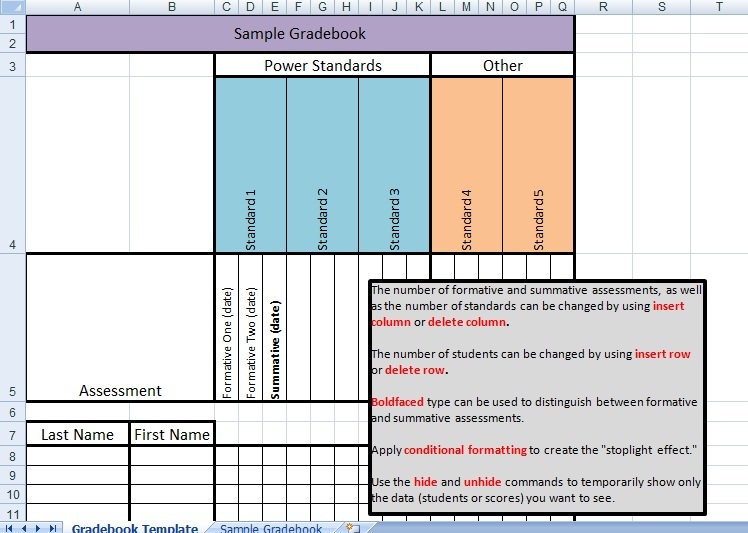 The image below is of the "Sample Gradebook" worksheet. It's my pride and joy at the moment. This puppy is fully loaded. Based on the previous template, it has sample student scores and then the various rules applied: conditional formatting, formulas, and various sparklines summarizing the data sets. You can change any of the numbers in the coloured squares and the worksheet will update for you. Heck, hide the numbers and just enjoy the graphs.